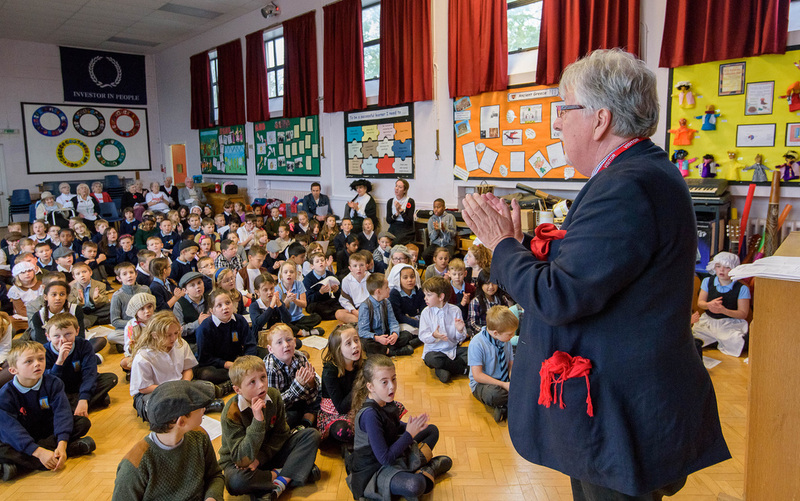 The children, staff and governors of Southdown Schools’ Federation were thrilled to welcome our local Golden Oldies group into school yesterday to join us for our Commemoration Day for the Centenary of the Great War. 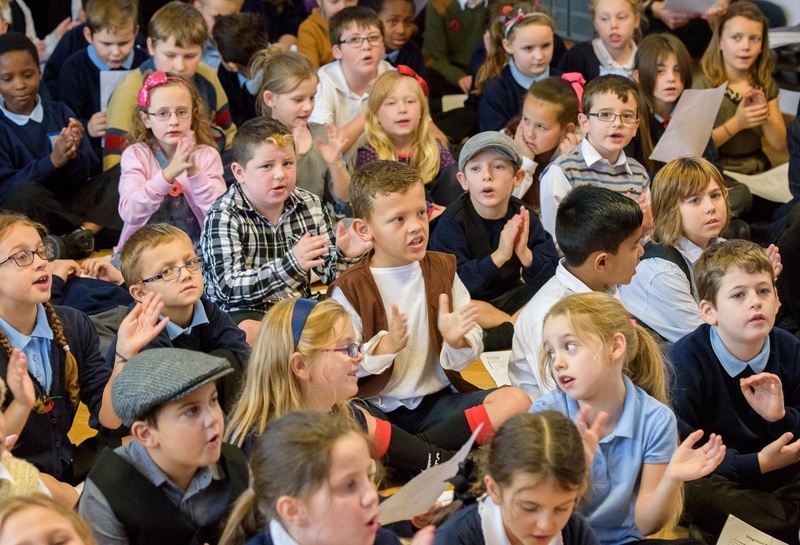 The Infant and Junior children and staff were dressed in typical outfits from the era and the day was part of a week- long project to raise awareness and understanding of the significance of World War One. Reports head teacher Sue Adams. 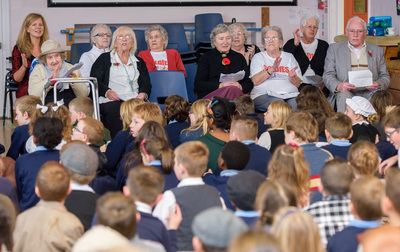 During the day the Golden Oldies joined us for our Commemoration Service in which the children shared poems about the war and sang songs, including the First World War Medley which they sang with the Golden Oldies. We observed the silence together, ending with a recording of the Last Post and a child reading ‘For the Fallen’ by Lawrence Binyon. The day was very special in many ways – the children and Golden Oldies enjoyed singing and being together and over lunch and tea they were able to share some memories; the Golden Oldies were each presented with a ceramic poppy made by the children as a momento of the occasion. What a fantastic day - writes Goldies Blagdon Session leader Jacqui Cook. The Goldies from Blagdon in Bath (close to the School) session loved being involved in the Southdown Primary school celebration of WW1 on Remembrance Day. We were warmly invited by the head teacher Mrs Sue Adams and began the day with an Assembly where all the teachers and children were dressed up in costume. Miss Grigg (who is usually very quiet) said 'Oo I do like all the lovely dresses'. Other lady Goldies had their pics taken with the men and one particular male teacher in uniform! There were poems and songs by the children. The poppy song was a Goldies favourite and I was asked if we could learn it! We had a silence at 11am. The children were fantastic and really well behaved. We then had a lovely roast dinner. They loved the sing song in the afternoon and beautiful ceramic poppies that the children had made, that were presented to them at the end of the day. The Goldies really enjoyed and appreciated the whole day and I am sure will be talking about it for a long time. The school made us all feel very welcome and for the Goldies very special – a special day!